Blaming the Centre for "punishing" the people of Kerala, the chief minister claimed that it was because the state was being ruled by the Left Democratic Front the central government made this decision. 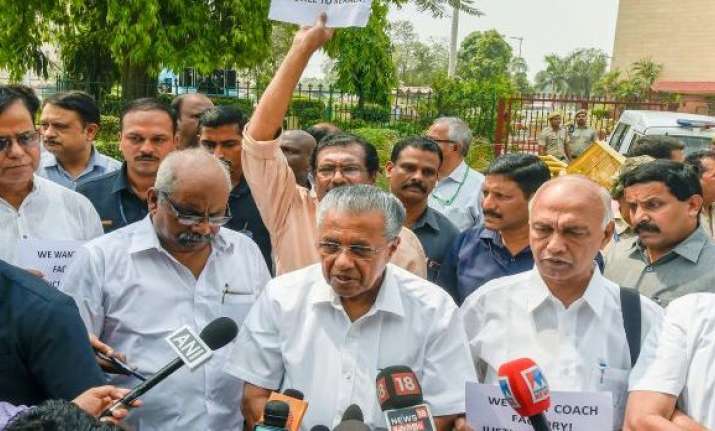 Kerala Chief Minister Pinarayi Vijayan and the Left Parliamentarians from the state on Friday staged a protest outside the Rail Bhavan in New Delhi against the Centre's decision to drop the proposal to establish a railway coach factory in Palakkad district of Central Kerala. Blaming the Centre for "punishing" the people of Kerala, the chief minister claimed that it was because the state was being ruled by the Left Democratic Front the central government made this decision. "The coaches, which are currently used in Kerala, are worn-out and creaking. The Centre has decided that a coach factory is not needed at Palakkad, but it seems they have agreed to open one in Haryana," Vijayan said. He added that Union Railway Minister Piyush Goyal had recently said that his ministry had sought land for a coach factory in Uttar Pradesh. "So they can open coach factories in Haryana and Uttar Pradesh, that too new ones, but not in Kerala. This is solely because Kerala is ruled by the Left Democratic Front and the other two states are ruled by the BJP. "Is this how a democratic country should function? Doesn't this amount to punishing the people of Kerala? Does this suit the federal system of the country? 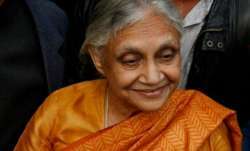 It shows that the Centre doesn't approve of democratic manners," the chief minister said. 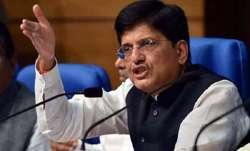 Goyal had recently said that the Centre has no immediate plans to initiate construction of the Rs 550-crore rail coach factory in Kerala, the long-anticipated development project of the state. The Union minister had also said that the railways had adequate facilities to meet the coach requirements and that the present facilities could meet the future demands as well. The Left Parliamentarians from the state, including Palakkad MP M B Rajesh, Idukki MP Joice George, Payyanur MP P K Sreemathy, Rajya Sabha MPs Elamaram Kareem and K K Ragesh, among others took part in the protest. 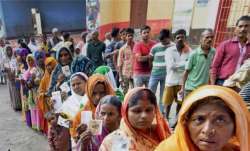 Vijayan, who led the protest, said that this issue showed how the Centre was treating the states. "How could the Centre torture a region? How could the Centre consider Kerala its enemy? How could the BJP and its leadership behave with enmity towards Kerala? This is not limited to Palakkad or Kerala. It's a national issue. 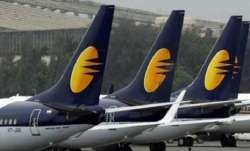 It shows how the Centre is treating the states," Vijayan said. 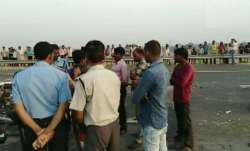 He said that Goyal and Prime Minister Narendra Modi must interfere in the matter. "We are here today because of the promises not honoured for last 36 years. The promises were first made in 1982 by the then prime minister Indira Gandhi regarding the setting up of a coach factory in Palakkad," Vijayan said. State Railway Minister G Sudhakaran had earlier lashed out at the Centre in the state Assembly and alleged that the Union government has given up the project even as a coach factory at Rae Bareilly had already been commissioned and a similar project for Chennai was being considered. The decision to set up the rail coach factory was announced in the 2008-9 Union Budget and state government had extended full support to the proposal. About 240 acres of land was acquired for the factory years ago.